Grant Besse heard the chants. Everyone in the near-capacity crowd heard the chants. Harsh words? Nah, not really. 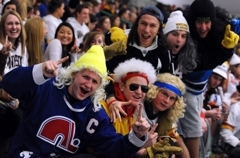 Besse, a Benilde-St. Margaret’s junior who lives in Plymouth and grew up playing in the Wayzata youth hockey system, couldn’t help but smile despite being targeted by the Trojans’ raucous student section. 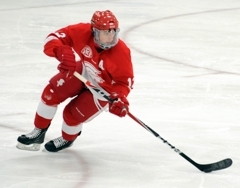 “After my second goal, I heard the ‘He’s a traitor chant,’ ” said Besse, who scored twice in the second period of the Red Knights’ 4-3 victory at the Plymouth Ice Center on Monday, Feb 6. “I thought that was kind of funny. I liked it. The fan-fueled jocularity helped ease the tension in what was otherwise serious business for the No. 8-ranked Red Knights. 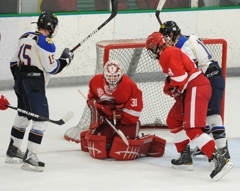 Benilde-St. Margaret’s (16-5-0) desperately needed the victory to improve its positioning in the upcoming Section 6AA playoffs. The Red Knights already had lost to section power and No. 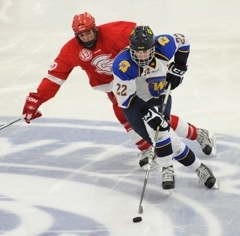 2-ranked Minnetonka, the frontrunner for the section’s top seed. Eden Prairie, Benilde-St. Margaret’s and Wayzata also figure into the top four, in a still-to-be-determined order, in the state’s toughest playoff grouping. 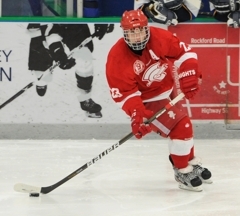 Beyond the section seeding implications and Besse’s homecoming of sorts, the game’s big storyline centered around Red Knights sophomore Jack Jablonski, who suffered a paralyzing spinal cord injury in a Dec. 30 junior varsity game against Wayzata. 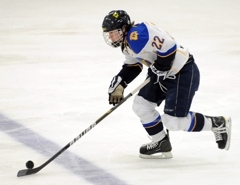 The teams had been scheduled to play in Plymouth less than a week after Jablonski was injured on a check from behind, but the junior varsity and varsity games were postponed to Monday. 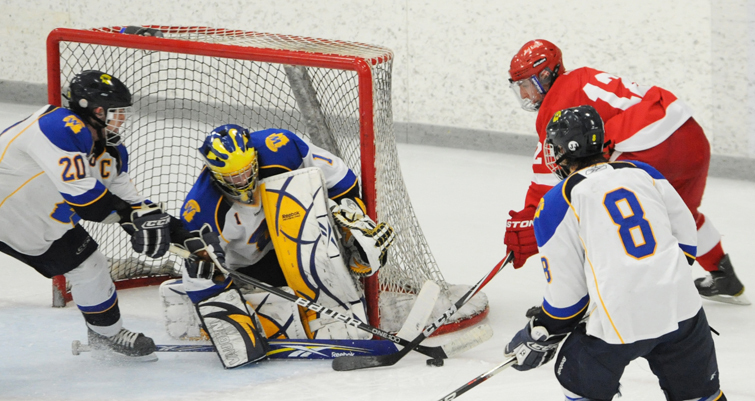 The Red Knights also hadn’t forgotten about their last varsity meeting with the Trojans. 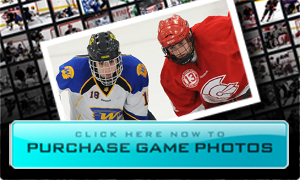 That came in the Section 6AA semifinals last season, a 6-3 Wayzata victory. 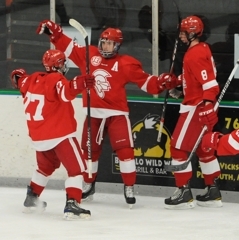 Besse’s uncanny scoring touch helped the Red Knights settle their old score with the Trojans. He scored from a sharp angle after curling out from behind the net, then unleashed a one-timer on a power play. 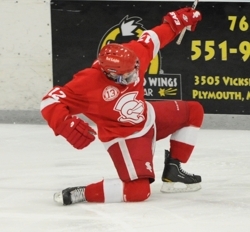 He has scored 20 goals in the Red Knights’ last seven games and has 35 this season. 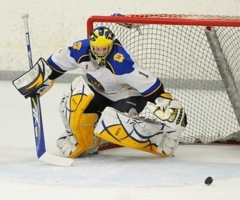 “He’s been scoring pretty much every single game for us,” Red Knights goaltender Justin Quale said about Besse, who has committed to play at the University of Wisconsin. “He’s been putting the puck in the net. 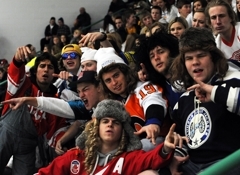 The parking lots surrounding the Plymouth Ice Center parking lot were full an hour before varsity game time, and the bleachers inside the building were bustling for what was certainly one of the most anticipated junior varsity games in state history. The Monday, Feb. 6, matchup between Benilde-St. Margaret’s and Wayzata was brimming with electricity at both the JV and varsity levels, the teams squaring off in games that had originally been scheduled for Jan. 5 but were rescheduled in the wake of the paralyzing spinal cord injury suffered by Red Knights sophomore Jack Jablonski in a junior varsity game. 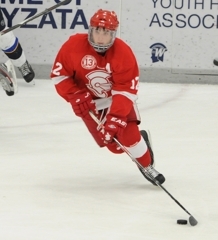 Jablonski was injured in a Friday, Dec. 30, game against Wayzata in St. Louis Park and is rehabbing at the Sister Kenny Rehabilitation Institute in Minneapolis. 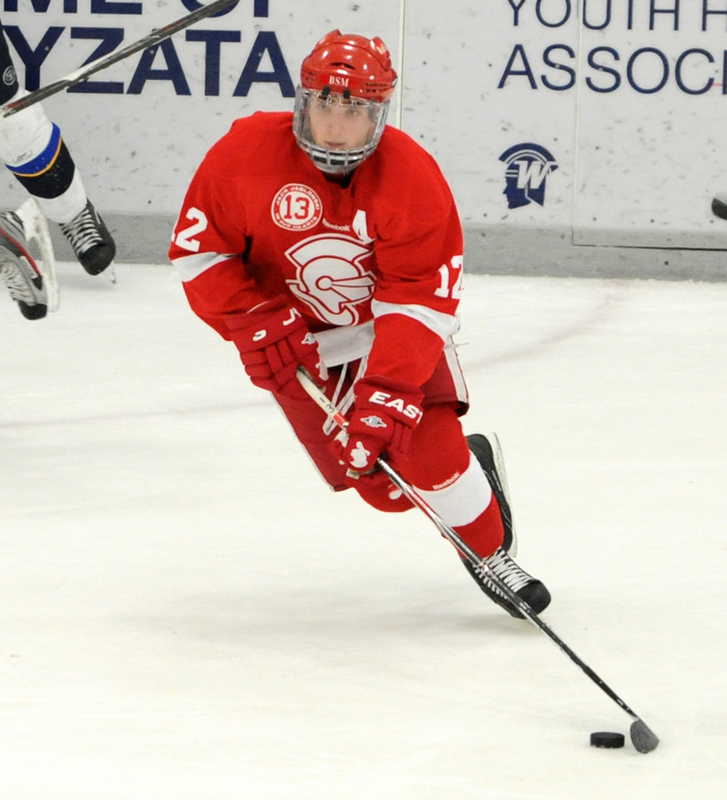 “Honestly, I thought it was a non-factor,” Benilde-St. Margarget’s coach Ken Pauly said about the effect of the highly charged game on his players after the Red Knights’ 4-3 victory in front of 1,322 fans. “I don’t think it was an issue at all. I thought it was far more of an issue for our junior varsity players because those were the two teams that were involved. 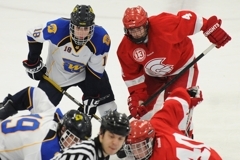 Both teams were called for 5-minute major penalties in the showdown of Section 6AA rivals. Both penalties likely would have been 2-minute minors before the Jablonski injury spurred statewide rules changes that stiffened the penalties for checking from behind, head contact and boarding. 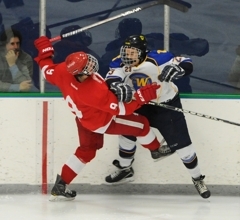 Wayzata resident Grant Besse scored twice in a four-goal second period for the No. 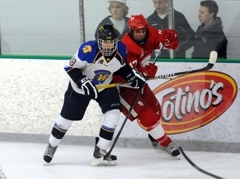 8-ranked Red Knights (16-5-0). 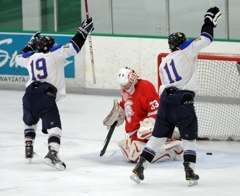 Kevin Miller scored with 2 minutes, 50 seconds left in the second period as Wayzata (13-7-1) pulled to within 4-3 entering the third period. 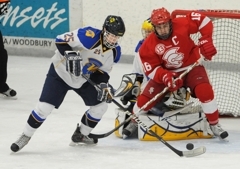 The Trojans were unable to capitalize on a 5-minute major penalty called in Red Knights’ forward Christian Horn early in the final period. 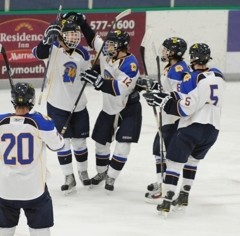 Wayzata won the junior varsity game 1-0. 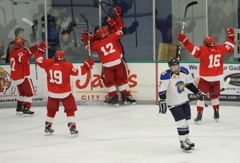 The junior forward continued his torrid scoring spree, notching two goals in the second period as the Red Knights turned a 1-0 deficit in a 4-1 advantage. 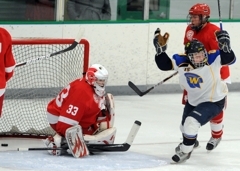 Besse, who grew up playing in the Wayzata youth hockey system, has scored an astounding 20 goals in his last seven games. The junior goaltender took over for starter Anders Jecha in the second period and was sharp in stopping 15 of the 16 shots he faced. Quale was at his best in the third period when he stopped 14 shots, several of them during a Trojans’ 5-minute power play. 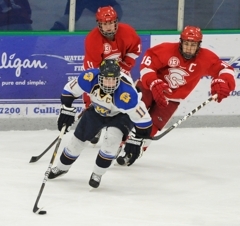 A senior defenseman, Halverson scored the only goal of the first period, blocked three shots and was effective moving the puck out of the Trojans' zone. 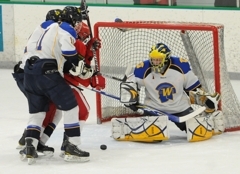 He also did a nice job setting up at the top of Wayzata’s power play.